(CNN) -- The Hubble Space Telescope was released into orbit Tuesday. An astronaut works on the Hubble Space Telescope during a spacewalk Monday. 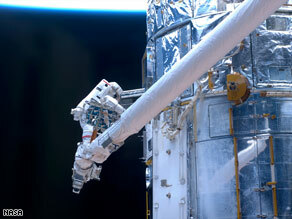 Space shuttle Atlantis crew member Megan McArthur used the shuttle's robotic arm to release the telescope at 8:57 a.m. ET. "With soft separation burn, Atlantis now is slowly backing away from the telescope," NASA said in a statement. "A jet firing will be performed in about a half-hour to increase Atlantis' separation rate from the telescope, as the seven crew members bid farewell to Hubble for the final time." Atlantis astronauts conducted spacewalks during the mission to perform routine repairs and replace key instruments. The mission has been one of the most ambitious space repair efforts ever attempted. Atlantis launched May 11 for NASA's fifth and final repair visit to the telescope.